Automatic Guided Vehicle Systems (AGVS) members are the Industry’s leading suppliers of automatic guided vehicle systems. They supply systems worldwide and in virtually every major manufacturing and distribution sector. Ergonomic Assist Systems and Equipment (EASE) is the primary entity within MHI focused on creating safer workplaces with increased productivity. Look to EASE for industry best practices and the latest industry solutions for manual material handling challenges. The Hoist Manufacturers Institute (HMI) members are the Industry’s leading suppliers of hoisting equipment including hand chain hoists, ratchet lever hoists, trolleys, air chain hoist, air wire rope hoists, electric chain hoists, and electric wire manufacturing and distribution sector. HMI operates through committees with programs and policies reviewed and adopted by the membership with representation from each member company. Its many activities include an active engineering committee. HMI is represented on a number of standards developing committees and actively supports the development and certification of safety standards by the ANSI consensus method. Institute of Caster and Wheel Manufacturers (ICWM) members are the Industry's leading suppliers of casters, wheels, bearings, and industrial trailer trucks, platform trucks and towline trucks. They supply caster and wheel solutions worldwide and in virtually every major manufacturing and distribution sector. The association was formed in 1933. The Lift Manufacturers Product Group (LIFT) members are the resource for industry best practices, standards, information, and equipment that lifts, rotates, tilts, and otherwise positions materials. Industry scissors lifts and tilters can also improve the working interface between people and the materials they must move to reduce injury, increase productivity, and eliminate wasted motion, while providing a significant return on investment. The Protective Guarding Manufacturers Association (ProGMA) members are the Industry’s leading suppliers of fixed protective guarding products designed to protect personnel, equipment, and inventory in industrial facilities. The Storage Manufacturers Association (SMA) members are the Industry’s leading suppliers of industrial storage equipment. They supply storage solutions worldwide and in virtually every major manufacturing and distribution sector. Solutions Community members are Industry’s thought leaders on automation, software, hardware, equipment and services that support a fully integrated supply chain. This includes suppliers, integrators, consultants, media, academia and users. They collaborate on solutions worldwide and in virtually every major manufacturing and distribution sector. 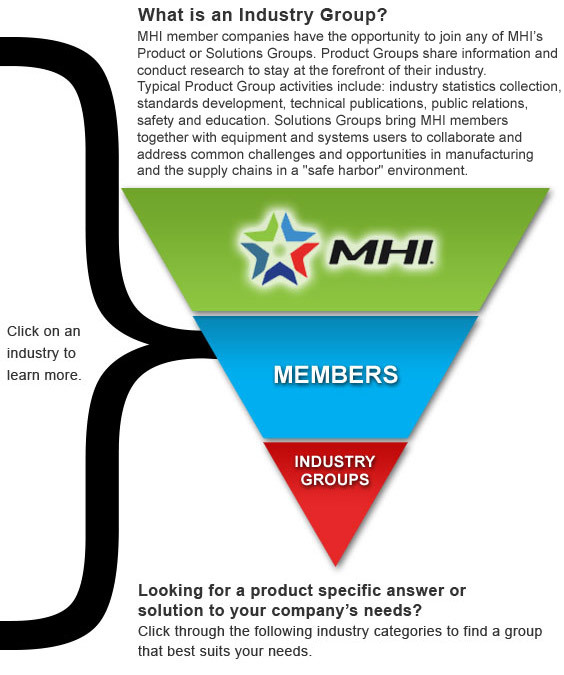 The philosophy of the Solutions Community is to support MHI’s mission of providing a unique venue where suppliers of material handling equipment and technology can collaboratively work with the user community to improve the marketplace for all. All participants adhere to a safe harbor no-buy, no-sell environment to openly discuss topics of mutual interest, including best practices, lessons learned and other information.